It is not uncommon to find weight shells with missing bottoms, and most every weight needs to be polished. This tid-bit focuses on a set of weights that needed both new end caps and polishing. Let’s cover soldering in new bottom caps in weight shells first. I was lucky enough to have the lead inserts come out of all three weights with just a bit of judicious shaking, and, for the two weights with no bottoms, prodding with a piece of wood. As an aside, it is not a good idea to try to pound a lead slug out of a weight shell with a hammer. What happens is that, rather than move, the lead expands, firmly setting itself in the shell. Or, worse when you hit a bit harder, bulging or breaking the shell. But, as I said, these three came out! Next I used a shellac chuck to turn out bottoms for the two shells that were missing theirs (see Tid-Bit 2 on shellac chucks). I don’t know how many of you have tried to solder in new bottoms in weight shells, but the typical problem is that you get solder all over the bottom of the cap when you try to get it to flow into that really tight joint between the shell and the bottom cap. Since I had the slugs out, I was able to solder from the inside – which virtually eliminated any excess solder on the outside of the shells! But, before getting into details of soldering caps – safety. When I solder I use small propane, butane or MAPP gas torches. I always clear everything off my work bench that can be readily ignited, such as rags, news paper, paper towels, steel wool (ever seen that stuff burn – it goes very easily – in fact, it can self ignite on a really hot day – be very careful where you leave the really fine – 0000 - stuff), cleaning solvents and other combustibles. I also think about how I am going to hold something when it is hot. While a pair of leather gloves will work for the other end of a long item (like a weight shell), a pair of pliers or a vise are necessary if the work piece is too short to insulate you from the heat. I also figure out a safe way to apply flux (typically the end of a tooth pick or a cotton swab) and where I am going to put the flux applicator after it has been dipped in the flux (you don’t want residual flux on your bench or on other tools). Since 90% or more of my soldering involves placing small chips of solder on the work piece, I also set up to cut these very small pieces of solder. I want all the tools I will need laid out where they are easily and safely accessed before I start soldering. Given the potential for solder to pop and spatter, I always wear eye protection, and it is a very good idea to wear leather shoes, just in case a drop of solder falls on your foot. It is amazing how quickly a drop of solder can slip through a canvas shoe and find your foot hiding inside. I also think about how I am going to hold the torch, and where it will be pointing, preferably away from my body. And, lastly, it is a good idea to have a moist towel on the bench just in case something doesn’t work quite right, or something decides that it wants to burn. Or, you find that you need to drop a work piece that has gotten a bit too warm to handle. Now, back to the weight shell. I turned new bottom caps so they fit rather tightly in the shells; once in place they stayed nicely. Then, I used a long cotton swab and applied a small amount of flux to the inside of the shell/bottom cap where I wanted to put the first bit of solder. I focused on wiping the surface of the brass to be soldered, without leaving enough flux to let the flux drip through the seam. Next I cut off a very small piece of solder (think 3 pin heads worth) and used the flux swab to position it on the inside of the weight shell, right on the seam. Holding the weight shell so the section of seam to be soldered was lower than the rest of the seam, and looking into the shell from above, I gently applied heat to the outside of the shell where the bit of solder was positioned until the solder flowed into the joint. The bit of solder was enough that it wicked and filled about an inch of the seam. I next soldered a similar section on the opposite side of the shell, then spent a bit of time doing small sections until the seam was filled. This worked extremely well with minimal solder showing on the outside of the shells. The next order of business was to polish the shells. The first photo shows the chuck I use to hold one end of weight shells. I tend to do weight polishing on my wood lathe because the wood lathe three jaw chucks typically have jaws that are better suited than the jaws found on a typical metal lathe. This picture shows my Stronghold chuck. 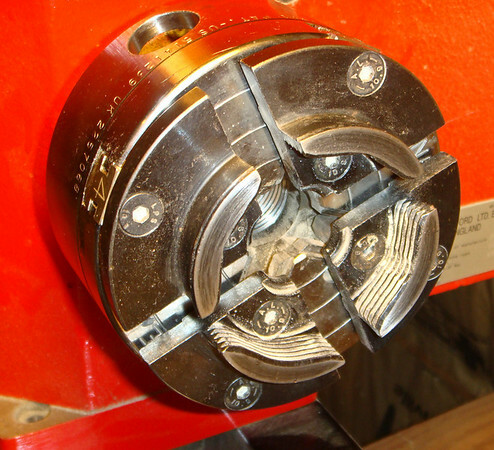 This particular chuck can be fitted with 3 different sets of jaws - a second set is shown in the third photo. The advantages over a conventional metal lathe 3 jaw chuck are significant. The jaw faces in this photo are a half inch deep, and over an inch long – spreading out the contact with the weight which helps to keep from bending weight shells. Typically a metal lathes three jaw chuck uses jaws with a rather narrow contact patch - which makes it very easy to end a shell.